Earlier in the week, I wrote a piece on Vertigo Comics and its big announcements at this past weekend’s San Diego Comic Con. With twelve new books coming at the end of the year, it’s hard not to look at where they’re at and wonder, “is Vertigo back?” after a multi-year slump in the face of creators moving more towards Image for personal projects. My takeaway was that they may not be back entirely, but for the first time in a while, there’s reason to be excited about about Vertigo’s line. The question shifted at the end though, and it became one for you, the readers. Is Vertigo back? I asked. Well, you answered and you can find the results below. Overwhelmingly, the answer was a wait and see approach. As much as we love to judge a book by a cover, at least for SKTCHD readers on these Vertigo debuts, that seems unfair to judge too soon on. I’m definitely leaning that direction myself, but at the same time, I can’t help but feel excited about what’s coming. 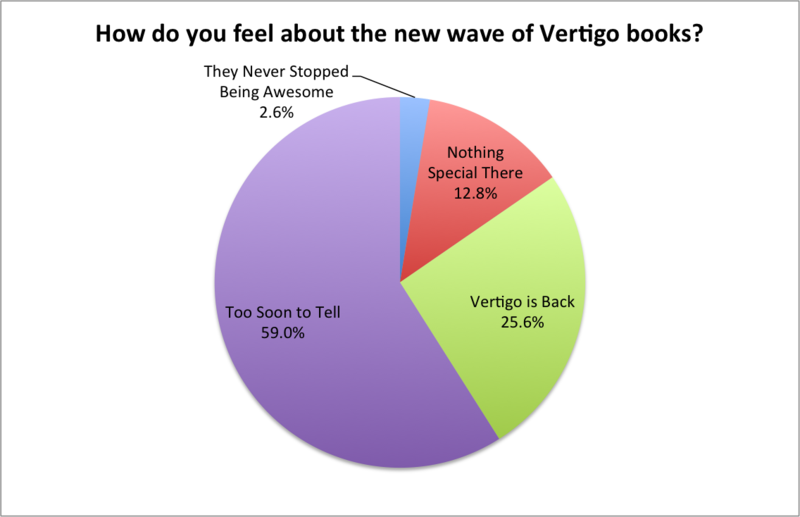 A lot of respondents agreed with that as well, as “Vertigo is BACK” came in as the number two response with over a quarter of those taking the poll selecting that option. The results are interesting and not altogether surprising. As with the last poll I ran, though, the most intriguing part were the responses from the people who elaborated on their thoughts. Take a look below to read some of the best responses. It’s great they are expanding the vertigo line. But are these real attempts at new original stories or an effort to market potential movie and TV franchises? Your mileage may vary depending on which creators you’re into, but none of the writers or artists of the recently announced Vertigo books inherently excite me. I may check out a few of the new titles based on whether the synopsis or an issue one cover grabs my attention, but gone are the days when names like Ennis, Azzarello, Ellis, Vaughan, or more recently Aaron or Wood drew me to new titles without a second glance at the actual content of their books. The reason for this is seemingly that those bigger name creators can get away with more or make more money at other companies. Honestly, it feels like Image has made Vertigo all but obsolete. It’s really hard to tell in Vertigo’s restructuring what titles will stand out in this new era of Vertigo. For the last 10 years, Vertigo had Fables, 100 Bullets, DMZ,and The Unwritten as its standout titles. Now its very hard to tell what books are going to be the next Vertigo books that will have people take notice of, especially with Image having been assumed to take Vertigo’s old prestige of adult titles. I have high hopes for the new books, but I don’t know yet what will stand out and what quality, other than the Hernandez/Cooke book we’ll get. I am hopeful for Tom King’s Sheriff of Baghdad, Lauren Beukes’ Survivors’ Club, and Michael Allred’s Art Ops as new books that will allow Vertigo to continue for more years to come. I don’t know if these series will pan out to be a new golden age for Vertigo, but this announcement coming out of nowhere really generates excitement. Everyone thought Vertigo was dead, but it appears they might have some breath left in them after all. I’m really excited about The Twilight Children, and New Romancer and Art Ops also look promising. There’s an interesting blend of people excited and not excited. The answer from the person suggesting that Image has made Vertigo obsolete is an idea I’ve thought before, but I agree with the last person: at the very least, it’s exciting they came from nowhere with this. Will it for sure result in anything? Absolutely not, which is why the poll itself resulted in so many people effectively saying we’ll have to wait to see. But at least there’s reason to be excited about what’s coming from Vertigo, as that is something we haven’t felt in some time.